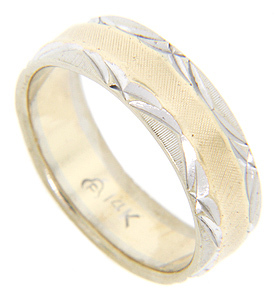 This 14K gold estate wedding band has a center strip of rose gold and two outer strips of white gold. The white gold strips have an angled/arched design and the rose gold is lightly textured. It measures .23mm wide. Circa: 1970. Size: 5 3/4. Cannot be resized.